The quality control tests of the Candid#1 vaccine required for internal release needs the use of rabbit immune serum (RIS). It is a biological reagent produced in INEVH and it must be qualified to ensure its proper use. The aim of this study was to estimate the expanded uncertainty (U) through validation studies of identity test in which the titles of IRS are determined, and thus establish its specification for use in control tests where the title of it is critical. Validation studies made possible calculate the U established by statistical analysis of the values obtained experimentally in intermediate precision, resulting=0.30. Determination of the U of the methodology established that 500 is the minimum qualification that must have an IRS to be used in quality control testing of the vaccine Candid# 1. The Candid# 1 [1-3] vaccine against FHA is produced at the National Institute of Human Viral Diseases Dr. Julio I. Maiztegui (INEVH) Argentina, and released internally through the execution of quality control tests established by the developer and finally registered in The National Administration of Medicines, Food and Medical Technology (ANMAT) . Among the controls for its release there are trials involving the use of a hyper immune serum obtained in rabbits. The antiserum is used to neutralize the in vitro vaccine and to use it in safety tests in suckling mouse (SM), safety tests in cell cultures and to demonstrate its identity [5,6]. Both SM and monolayers of Vero C76 cell cultures are susceptible to Candid# 1 strain of Junín virus (JV) [7-9]. In order to evaluate the absence of adventitious agents in both substrates it is necessary to neutralize the vaccine with a specific antiserum obtained in rabbits (RIS) with a titer that ensures the absence of free virus in the control system [10,11]. The SM safety test 10 is performed by inoculating mice of less than 24 h with Candid# 1 (104 PFU/ml) neutralized with RIS by intracranial route (IC) and intraperitoneal (IP). Viral fluid (104 PFU/ml) neutralized with RIS is inoculated in the cell culture safety test. In both cases the ability of the antibodies provided by the RIS should be sufficient to inhibit the biological activity of the virus. In the identity test, Candid#1 vaccine (104 PFU/ml) is challenged with serial dilutions of RIS to obtain 80% inhibition of Candid# 1 PFU in the under agar plate reduction neutralization test (PRNT), "gold standard" in the serological diagnosis of arena virus infections 5 detecting antibodies directed to surface glycoprotein epitopes primarily 6. To determine the identity of the vaccine an assay is used that measures the ability of the antibodies to inhibit the biological activity of the virus. The smallest amount of virus should be readily detectable so that small amounts of antibodies can produce demonstrable inhibition, for example, in PRNT assays. This technique uses the ability of the virus to spread from the infected cell to neighboring cells producing plaques, consisting of a focal cytopathic effect. Specific antibodies provided by RSI transform viral particles into non-infectious ones by a mechanism involving linkages of immunoglobulin molecules to virion surface receptors involved in binding of the virus to the membrane of the host cell. Because of the symmetry of the viral particles, each contains more than one binding site, however, a limited number of immunoglobulin molecules are required to neutralize the virus [5,6,12]. The test is designed to determine the identity of batches of vaccine produced and thus to confirm that the content of the vaccine corresponds to that stated on the package label. Validation of the identity test by studying the following parameters: intermediate accuracy and linearity [13,14], Will allow calculating the uncertainty of the method of titration of anti-JV immune serum in rabbits. Uncertainty is a parameter associated with the final expression of the measurement result that characterizes the dispersion of values that could be reasonably assigned to the measurement . When reporting the result of a measurement, some quantitative indication of the quality of the measurement must be provided, so that the user can evaluate its reliability. Without such an indication, the results of the measurements could not be compared either to each other or to reference values given in a specification or standard. The sample or statistical evaluation of uncertainty, based on experimental data, is known as uncertainty type A, such as calculating the standard deviation of the intermediate precision test from n repetitions. Metrology allows two ways to express uncertainty, on the one hand the standard uncertainty that corresponds statistically to the standard deviation and on the other hand the expanded uncertainty that corresponds statistically to the confidence interval. The objective of the present study was, based on the knowledge of the expanded uncertainty, to standardize the minimum anti-VJ SCI titre for use in in vivo and in vitro safety assays and to establish the titre range for use in the identity assay. Cells Vero C76: African green monkey kidney epithelial monolayer, (Cercopithecus aethiopis) 80-90% confluent, planted 48 hours before in 6 wells trays, between passages 34 to 42. The cell line was grown in EMEM (GIBCO), supplemented with NEAA, 5% heat inactivated (56ºC for 30 minutes) fetal bovine serum (INTERNEGOCIOS SA), 293 μg/ml, 2 mM L-glutamine SIGMA-ALDRICH), 100 IU Penicillin/ml (SIGMA) and 100 μg/ml Streptomycin (SIGMA). The cell lines used are certified in their identity and have no foreign contaminants (bacteria, fungi, mycoplasma and viruses). Vaccine Diluent: EMEM supplemented with NEAA+1% L-glutamine (3 mM total)+2% SFB+1% Penicillin+Streptomycin (P+S). Medium for plates: Earle 10X, 1% yeast extract (DIFCO), 6% SFB, 7.5% sodium bicarbonate (SIGMA), lactobumin hydrolyzate (BD), Hepes 1M (SIGMA). Specific antiserum obtained in rabbit (RIS): It is obtained from successive immunizations in rabbits (New Zealand breed) at different times with different immunogens. It is initiated with multiple subcutaneous (SC) and intramuscular (IM) inoculations of a JV suspension (3790 strain) newborn mouse brain equivalent to 107 PFU/ml and complete Freund's adjuvant (GIBCO). The first stimulation with Candid# 1 (104 PFU/ml) supplemented with normal rabbit serum (NRS) and incomplete adjuvant was performed monthly. This last step is repeated on day 56. The collection of the blood samples and separation of the respective serum is performed from day 63. It is titrated and subsequently released to be used in the safety and identity tests. Reference Virus (RV): Prepared at the INEVH facilities. For this, 10 vials of Candid#1 vaccine are removed from the freeze chamber; the vials are opened and resuspended with 5.5 ml of sterile water for injection (API). Resuspended vaccine vials are kept refrigerated and leave to stand for 15 minutes. A pool of contents of 10 vials is made in an appropriate container. The fractionation is performed in 1.2 ml vials, placing 0.8 ml in each. The vials are identified by a label like "Virus Junín Reference" detailing batch and preparation date. They are stored in freezers at a temperature of -70ºC. The performance of the RV is evaluated by control charts. It consists on facing the vaccine with RIS in a PRNT assay. The RIS title is calculated. It should be noted that the vaccine has been neutralized. In order to calculate the number of PFUs that would correspond, at a given percentage of plaque reduction, as evidence of neutralization, series of dilutions of the Junin reference virus were made. The dilution is chosen where 30 PFUs are found on average 11 and the number of PFUs corresponding to the percentage of neutralization required is calculated. 80% of the neutralization of the plates is required; the average number of plates obtained in the virus is multiplied by 0.2. The plate reduction neutralization titre 80 (PRNT80) of the RIS will be the highest dilution causing an 80% reduction in plate number. To know the final title of SCI, serum dilutions are tested according to historical data and the following calculations are performed. The validation of the identity test was performed and some of the criteria found in the Argentine Pharmacopoeia were used for the validation of the immunochemical method [16,17]. The parameters studied for the validation were: intermediate precision and linearity. Approved batches of RV and RIS were used. The validation was performed retrospectively. Intermediate precision: 22 determinations were performed with different samples of VR lots, different lots of SCI, at different times and different analysts. A statistical evaluation of the uncertainty was performed, based on experimental data (Type A). The expanded uncertainty was calculated from the standard deviation obtained in the intermediate precision test. Table 1: Identity assay, Normal distribution, Statistical parameter. The results obtained from each parameter studied were plotted in Figure 1. Figure 1. 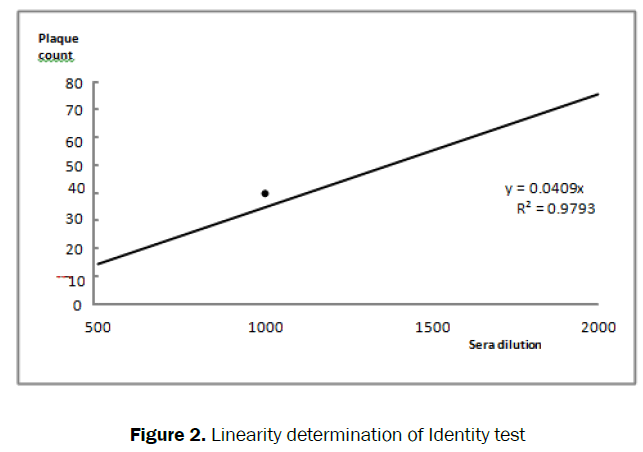 Intermediate Precision study of the identity test. A: 3.0; SD: 0.15; CV: 5.0; Var: 0.022. Figure 2 shows the results obtained for the linearity test. (Figure 2). The assay demonstrates linearity for the different dilutions (R2=0.9793). To report the result transform Y into antilogarithm being, U: Expanded uncertainty U: standard deviation of the 22 determinations K: coverage factor Y: result obtained from each determination Y: final expression of the result. In biological tests it is essential to establish a quality control system within the test method must be considered in order to ensure optimum quality of results . 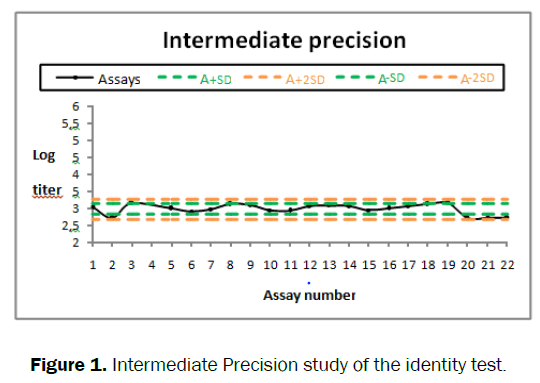 After Candid#1 vaccine identity assay methodology validation, U was calculated for the expression of the RIS titre result and thus the minimum titre of the vaccine was established. The average titre obtained was 3 logarithmic units (1000), so that by incorporating the calculated U (0.30 log units) a range (3 +/- 0.30) for the RIS titre from 500 to 2000 was established. The studied antisera have been shown to possess sufficient antibody titre to neutralize the vaccine virus, ensuring that no interferences will occur in the safety assays on JV susceptible biological substrates such as suckling mice and Vero cells. The establishment of the RISI specification for its use as a biological reagent in quality control tests is of great importance in terms of safety and quality of results. The validation of the immune serum production method in rabbit anti-Junin Virus and its requirement for its use as a critical input in the Candid#1 vaccine release trials was demonstrated. To the National Administration of Laboratories and Institutes of Health (ANLIS) and to the Ministry of Science and Technology (MinCyT) for the financing of a scientific scientific scholarship within the institutional improvement plan, the National Institute of Human Viral Diseases "Dr. Julio I. Maiztegui. "(INEVH) where the present work was developed. To each of the people who are part of the Quality Control and Assurance team: Nahuel Martinez, Gisele Lázzari, Carina Paz, Alejandro Bottale, Alejandro Raggio, Sebastián Fossa, Florencia Cantore. MacDonald C, et al. Initial clinical assessment of humans inoculated with a live-attenuated Junin virus vaccine.” Programs and abstracts of the VII International Congress of Virology. 1987, pp. R3-27. Maiztegui JI and JrMcKee KT. Inoculation of human volunteers with a vaccine against Argentine hemorrhagic fever. Program and abstracts of the VI International Conference on Comparative and Applied Virology. 1989, pp. S4. Maiztegui JI, et al. Protective efficacy of a live attenuated vaccine against Argentine Hemorrhagic Fever. J Infect Dis. 1998;177: 277-283. Provision ANMAT 4882/06. Authorization to Register the Candid#1 vaccine to the Register of Medicinal Specialties.2006. Fazekas de St Groth S. The neutralization of viruses. In Adv Virus Res. 1962;9:1-125. Rhim JS, et al. Growth of junín virus, the etiological agent of Argentinian hemorrhagic fever, in cell cultures. Arch Gesamte Virusforsch. 1967;21:243-252. Giovanniello OA, et al. Immunosupression in experimental Junín virus infection of mice. Intervirol.1980;13:122-125. MC Weissenbacher, et al. Experimental biology and pathogenesis of Junín virus infection in animals and man. B. World Health Organ.1975;52: 507-515. Webb P, et al. The measurement of specific antibodies in Bolivian hemorrhagic fever by neutralization of virus plaques. Proc. Soc. Exp. Biol. Med. 1914;130: 1013. Damonte EB, et al. Cross reactivity between Junín and Tacaribe viruses as determined by neutralization test and immunoprecipitation. Med. Microbiol. Immunol1986;175:85-88. Dellepiane N, et al. New challenges to ensure the quality of vaccines. Bulletin of the World Health Organization: the international journal of public health: compilation of articles. 2000;3: 43-5015. ATCC Quality Control Methods for Cell Lines, Second edition, 1992.